Table sugar (sucrose) has 4 calories per gram. Sugar substitutes are used to limit food energy during dieting, to reduce the formation of dental plaque, and to help regulate blood sugar levels in diabetic individuals. Sugar substitutes are used to reduce the calories in foods and drinks. Sugar substitutes may be natural products such as sorbitol or xylitol, or they may be artificial sweeteners created in a laboratory like saccharin, sucralose or aspartame. In the United States, the Food and Drug Administration (FDA) has approved the following non-caloric sweeteners: saccharin, aspartame, sucralose, neotame, and acesulfame potassium. Neotame is between 8,000 and 13,000 times sweeter than table sugar. Neotame is chemically similar to aspartame, but sweeter and more stable. Neotame is hydrolyzed to produce methanol (wood alcohol) and de-esterified neotame residue, but since neotame is used only in very small amounts, the amount of methanol produced is less that what is found in fruit juices. 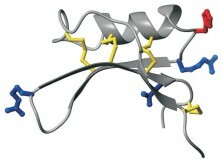 The 3,3-dimethylbutyl group attached to the amino group of the aspartic acid portion of the molecule blocks the enzymes which would break the peptide bond between the aspartic acid and phenylalanine moieties. The Food and Drug Administration approved neotame for general use in July 2002. Acesuflame Potassium (Acesulfame K, Ace K) is a nonnutritive sweetener 200 times sweeter than table sugar marketed under the brand name Sunett. At high concentrations, it has a slight bitter aftertaste like saccharin. 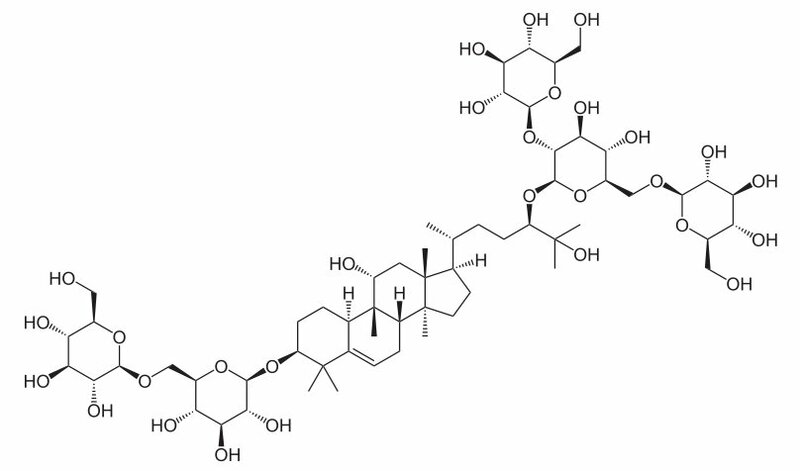 Its chemical structure is the potassium salt of 6-methyl-1,2,3-oxathiazine-4(3H)-one 2,2-dioxide. Some test results have hinted that acesulfame potassium may increase the occurrence of breast tumors in laboratory animals, but the FDA has not required additional safety testing. Sucralose is marketed as Splenda. It is available as a tabletop sweetener and as an ingredient in food processing. Sucralose is about 600 times sweeter than table sugar. Sucralose is stable at hot and cold temperatures and can be used in cold and hot drinks, as well as baked goods. 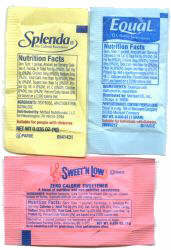 Although Splenda is marketed as a no calorie sweetener, it is a mixture of dextrose, maltodextrin, and sucralose. Ten grams of Splenda contain 9.00 g of carbohydrates consisting of 8.03 g of sugars (dextrose) and 0.96 grams of starch (maltodextrin). For this reason, 10 grams of Splenda have 33 Calories compared to 39 Calories for an equal weight of sugar. The calories of Splenda come from the carbohydrates. Recent formulations of Splenda use resistant maltodextrin which can be categorized as fiber. Cyclamate is 30 to 50 times sweeter than sugar and is sold under the trade names Sucaryl and Sugar Twin. Cyclamate is the sodium or calcium salt of cyclamic acid (cyclohexanesulfamic acid). Cyclamate was banned in the United States in 1970 because large doses caused bladder cancer in rats, but it is still approved as a sweetener in more than 55 countries. Nectresse is the trade name of a mixture of monk fruit extract and erythritol, a sugar alcohol. The extract of the monk fruit, also known as Luo Han Guo (Siraitia grosvenorii), is approximately 300 times sweeter than sugar and has been used as a natural sweetener in Chinese traditional medicine for about 1000 years. The sweetness of the fruit is due to five different mogrosides, the main of which is esgoside (mogroside V). On weight basis, brazzein is about 1000 times sweeter than sugar. The taste of brazzein is similar to sucrose but with lingering sweet aftertaste. Brazzein is stable over a broad pH range from 2.5 to 8, and it is heat stable at 98°C for 2 hours. This makes it practical for many commercial applications. Large scale extraction of the sweetener from its natural source is not feasible, but brazzein has been produced from genetically engineered corn. The protein from the modified corn contains 4% brazzein, which when purified is up to 1200 times sweeter than sucrose on a weight basis. In addition, brazzein-containing maize germ flour can be used directly to sweeten food products. The company Natur Research Ingredients expects to make brazzein commercially available in 2009 under the brand name Cweet. Most non-caloric sweeteners are mixed with dextrose and maltodextrin to provide bulk, but unfortunately, these bulking agents are digestible carbohydrates that add calories. As we have seen for Sweet'N Low, Equal, and Splenda, ten grams of these sweeteners provide from 33 to 36 calories compared to 39 calories for sugar. On a weight basis, these sweeteners can reduce the number of calories only by 10 to 15 percent when compared to sugar, which is not significant. However, these sugar substitutes allow the calories of sweetener to be reduced by approximately 80 percent because, in the case of Splenda, one packet containing 1 gram of product (3.3 Calories) has the same sweetening power as one teaspoon of sugar weighing 4.2 grams (16.3 Calories). Manufacturers purposely package these sweeteners in small packets with less than 5 calories per serving, thus meeting the FDA standards for "no calorie" foods. The small serving size allows the products to be marketed as zero-calorie sweeteners. One would expect that drinks with non-caloric sweeteners would promote weight loss, but epidemiological studies have found that consumption of diet soda is associated with the development of metabolic syndrome. The ingestion of non-caloric sweeteners dissociate the sensation of taste as a predictor of the caloric or nutritive content of food. Experiments have found that reducing the correlation between sweet taste and the caloric content of foods using artificial sweeteners in rats resulted in increased caloric intake, increased body weight, and increased adiposity. The results suggest that consumption of products containing artificial sweeteners may lead to increased body weight and obesity by interfering with the fundamental equilibrium of physiological processes mediated by taste receptors. Although artificial sweeteners are promoted as aids to weight loss and diabetes prevention, they may actually hasten the development of glucose intolerance and metabolic disease by alterating the composition and function of the bacteria in the intestines. The research, which was conducted in mice and humans, showed that normal glucose tolerance was restored by administering antibiotics to kill the bacteria that had colonized the intestine during the period when artificial sweeterners were consumed. The microorganisms that inhabit our body, called the human microbiome, constitute an integrated ecosystem that affects our health.